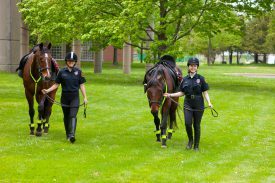 Share the post "Final Dismount for Graduating Mounted Patrol Officer Jaclyn Bird (SEBS ’18)"
Jaclyn Bird (r) and fellow MP officer Hala Essenmacher, take new recruit Nico for his first time exploring campus. The team introduced him to everything on foot before riding him. Nico joined the unit in November 2017, coming from the Standardbred Retirement Foundation. Photo courtesy Jaclyn Bird. Ever since a young age, Jaclyn Bird has always been outside riding horses. Growing up in West Deptford, NJ, she followed in her older sister’s footsteps and began riding when she was eight years old. Although it was an activity for fun when she first started, Jaclyn became more serious about horseback riding. She started competing at schooling shows and smaller competitions when she was 12 years old. She has continued to compete in dressage and jumping through the Intercollegiate Horse Show Association (IHSA) at Rutgers University. Always wanting to be close to home and near her family, Jaclyn decided to attend Rutgers School of Environmental and Biological Sciences for her undergraduate education. She became involved in on-campus activities like the Rutgers Equestrian Team and the Seeing Eye Puppy Raising Club. During the second semester of freshman year, she joined the Rutgers University Mounted Patrol. The Rutgers Mounted Patrol is the only student-run mounted patrol service in the entire nation, and it has been an incredible opportunity that Jaclyn has enjoyed. She always liked the premise of being a community service officer in order to help and impact the Rutgers community on a daily basis. Jaclyn explained that the process of becoming a Mounted Patrol officer was a rigorous and challenging journey. First, if accepted to the Community Service Officer program, there is a written test based on general horse knowledge and related situations. After passing the written exam, there is an interview with the supervisors of the mounted patrol, followed by an intense riding exam to ensure the new service officers are competent in their riding and horse management skills. Once she was qualified, Jacyln had to attend training, alongside other police and security officers, to officially become a community service officer. Community service officers are full-time students who are uniformed, unarmed paid employees of the Rutgers University Police Department. 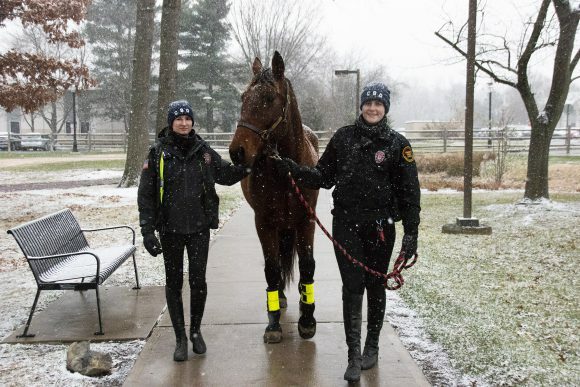 Founded in the 1970’s, the Rutgers University Mounted Patrol was originally a part of the Rutgers University Police Department (RUPD) and staffed by RUPD officers. This was eventually transitioned to a student Community Service Officer Program supervised by Rutgers University Public Safety. Jaclyn explained that there are three horses that are a part of the Mounted Patrol unit: Norman, Austin, and Nico, all from the Standardbred Retirement Foundation. The horses are cared for and ridden by the fourteen members of the Mounted Patrol Unit. Two officers and two horses go out daily and patrol around the Cook/Douglass Campus. Jaclyn describes how she helps up to 30 people a day–ranging from giving directions to allowing someone to pet a horse for the first time. She loves being a part of such a light-hearted experience, and believes in the importance of having this positive association with law enforcement and horses. Jaclyn excelled in her position and ultimately served as company supervisor of the Mounted Patrol, sharing the responsibility with junior Victoria Perez. Jaclyn was selected this past year to be an executive aide, and spent time driving Rutgers President Barchi, Rutgers–New Brunswick Chancellor Dutta, and other chancellors around campus and other locations. “Some of my favorite memories are going to President Barchi’s house with the Mounted Patrol horses for breakfast before every homecoming!” she exclaimed. 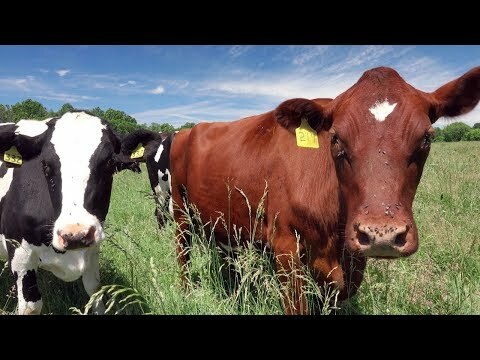 Jaclyn majored in Animal Science with a concentration in pre-veterinary medicine and research, and as her senior year draws to a close, she plans to apply to vet schools this summer. She has also been raising her own puppy, an 8-month-old German Shepard named Henry, for the Seeing Eye Puppy Raising Club. Excited to move on to something new and exciting, she knows she will always come back to visit the horses, and the events like Ag Field Day at Rutgers Day. Thank you for your service Officer Jaclyn Bird, we are ready to see you move on to your next chapter! To learn more about the Rutgers Mounted Patrol, visit their Facebook page.